Propulsion: Two nuclear reactors, four shafts. Length: 1,092 feet (332.85 meters). 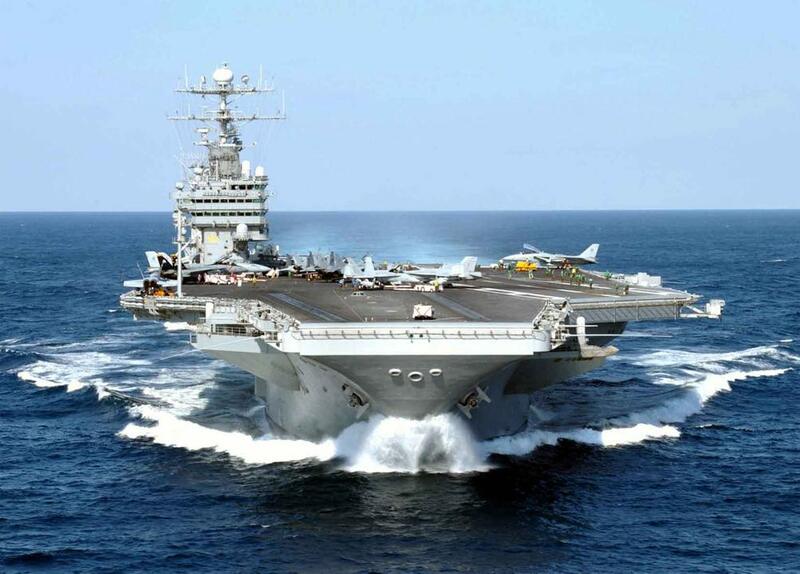 Beam: 134 feet (40.84 meters) ; Flight Deck Width: 252 feet (76.8 meters). Displacement: Approximately 97,000 tons (87,996.9 metric tons) full load. Speed: 30+ knots (34.5+ miles per hour). Crew: Ship's Company: 3,200 - Air Wing: 2,480. Armament: Two or three (depending on modification) NATO Sea Sparrow launchers, 20mm Phalanx CIWS mounts: (3 on Nimitz and Dwight D. Eisenhower and 4 on Vinson and later ships of the class.). Aircraft: 85. In 1994, during George Washington's maiden deployment the ship served as the backdrop for the 50th anniversary of D-Day. The USS George Washington was also critical in responding to Iraq's threatened second invasion of Kuwait being called to the Persian Gulf for the second time in the deployment. When the Ship entered the Red Sea Iraq began its pullback of troops from the border. On its fourth deployment from 21 June 2000 to December 2000, George Washington again spent a large portion of the six-month deployment in the Persian Gulf as the centerpiece of the U. S. military presence there. The deployment included operations in the Mediterranean Sea, Indian Ocean and Persian Gulf. While in the Persian Gulf, the battle group supported OSW by flying more than 800 sorties over Iraq. Surface forces supported UN sanctions against Iraq by conducting Maritime Interception Operations and diverting more than 20,000 metric tons of oil smuggled out of Iraq in violation of UN sanctions. In the Adriatic, the battle group was a stabilizing presence when tensions rose in the region after presidential elections in Yugoslavia. During the deployment, battle group ships steamed more than 400,000 nautical miles (740,000 km) and spent a combined 1800 days underway. The aircraft of Carrier Air Wing 17 (CVW-17) flew more than 9,000 sorties and made 9,000 arrested landings aboard George Washington. George Washington returned to home port on 19 December 2000. On 13 February, George Washington began a six-month Planned Incremental Availability (PIA) at Norfolk Naval Shipyard. The ship received upgrades to many ship systems, including berthing spaces, ventilation systems, and computer networking. On 31 July the ship began four days of sea trials before returning to homeport in preparation for workups for a planned 2002 deployment. On 6 September George Washington was presented with the 2000 Battenberg Cup, awarded annually to the Atlantic Fleet ship or submarine with the greatest crew accomplishments during the previous calendar year. It was the second time GW had won the award (the ship was also the winner of the 1997 award). The crew also accepted the Flatley Award for aircraft carriers with the best aviation safety record. On the morning of 11 September, George Washington was operating off the coast of Virginia conducting routine carrier qualifications when the 11 September attacks took place. She was diverted north and arrived in New York City the following day. For the next three days, the ship and her air wing (most of which was hastily transferred from USS John F. Kennedy (CV-67)) provided airspace defense for the city and surrounding area in coordination with NORAD. The ship then returned home and resumed the Inter Deployment Training Cycle. From 2 to 29 November George Washington participated in Tailored Ship's Training Availability (TSTA) I/II. For the remainder of the year and into 2002 the ship hosted more carrier qualifications. Washington transits the Atlantic Ocean as she and her embarked (CVW-17) return after conducting missions in support of Operation Enduring Freedom and Operation Southern Watch. The George Washington Battle Group deployed on 20 June 2002 and headed for the North Arabian Sea where it relieved the USS John F. Kennedy (CV-67) Battle Group on 19 July. On 11 September 2002, George Washington was relieved by the USS Abraham Lincoln (CVN-72) Battle Group in the Persian Gulf, where George Washington had been supporting Operation Southern Watch and Operation Enduring Freedom. On 2 October the crew was treated to a flight deck concert by the band 3 Doors Down while the ship was making a port visit to Lisbon, Portugal. Footage from this concert and the band's tour of the ship was used in the video to the band's single "When I'm Gone". The George Washington Battle Group returned to Norfolk on 20 December 2002. During the six-month deployment, George Washington launched approximately 10,000 sorties. Washington personnel carry injured personnel across the ship’s flight deck after four personnel were rescued from the burning merchant fishing vessel, Diamond Shoal. On 23 June George Washington was presented with the 2002 Battenberg Cup. It was the third time the ship had won the prestigious award. On 11 September while the ship was operating off the coast of Virginia, an arresting wire parted while an F/A-18 was landing. As the wire parted, it snapped back violently across the deck, injuring eleven crewmen, two critically (the wire nearly hit an additional crew member but he jumped above the wire in time). The sailors, who were part of the ship's company, VAW-120 and VFA-106 had to be medically evacuated from the ship but all survived the mishap. The aircraft was lost over the side but the pilot was able to eject safely. Footage of the mishap was later used in a National Geographic special about the ship that was being filmed at the time. GW returned to Norfolk, Va., 19 December 2003 after 40 days at sea, where she successfully completed her Composite Training Unit Exercise (COMPTUEX). The GWSTRKGRU was composed of Destroyer Squadron 28 and Carrier Air Wing 7 (CVW-7), USS Vella Gulf (CG-72), USS Ramage (DDG-61), USS Ross (DDG-71), USS Bulkeley (DDG-84), USS Elrod (FFG-55) and USS Supply (T-AOE-6). The exercise involved more than 7,600 sailors operating off the coasts of Virginia, North Carolina, Georgia and Florida. Having completed this final phase of the training cycle, the strike group assumed surge status and is fully qualified to deploy. The Navy announced on 13 January 2004 that the George Washington Carrier Strike Group would depart for a "surge" deployment a week later. On 20 January GW, with CVW-3 embarked, deployed in support of the global war on terrorism. George Washington made a port visit at Souda Bay, Crete beginning on 6 February through 10 February 2004. On 16 February, George Washington transited the Suez Canal and entered the Red Sea on 17 February. On 20 February George Washington entered the Gulf of Aden and a week later was conducting operations in the Persian Gulf. On 13 March the ship made the first of three port visits to Jebel Ali, United Arab Emirates. On 8 April, F/A-18 Hornets from Carrier Air Wing Seven participated in Operation Vigilant Resolve. One of the Naval Air Station Oceana-based “Wildcats” from Strike Fighter Squadron 131 (VFA-131) conducted a 20 mm strafing run against an enemy position. Another VFA-131 Hornet dropped two 500 pound GBU-12 laser-guided bombs on another enemy position in Fallujah, Iraq, on 9 April. This was the first live ordnance dropped by CVW-7 aircraft since George Washington deployed in support of Operations Iraqi Freedom and Enduring Freedom. After being relieved by the USS John F. Kennedy (CV-67), the ship began her transit home, making a final port visit at Naples, Italy from 14–18 July. After traveling more than 51,000 nautical miles (94,000 km) and spending six months at sea, George Washington completed its sixth Mediterranean and Persian Gulf deployment and returned to Norfolk on 26 July. GW and CVW-17 left Norfolk on 4 April for a scheduled two month deployment to operate as part of SOUTHCOM's "Partnership of the Americas". This deployment included counter-drug operations in the Caribbean Sea, crew exchanges and exercises with Latin American and South American navies, and port visits for the carrier and strike group, which consisted of USS Monterey (CG-61), USS Stout (DDG-55), and USS Underwood (FFG-36). The first of these port visits took place from 14–17 April in St. Maarten, and Antigua from 15–18 May. GW returned to Norfolk on 24 May. In a ceremony held on 1 September, Commanding Officer Garry R. White was promoted to Rear Admiral, marking a rare occasion when a Flag Officer commanded a ship. She entered Norfolk Naval Shipyard for a Planned Incremental Availability in September to prepare for her upcoming homeport transfer to Yokosuka Naval Base in Yokosuka, Japan. Work included removal and replacement of the ship's radar mast, propeller screws, and re-alignment of the Aviation Intermediate Maintenance Department. On 14 December, Rear Admiral White was relieved by Captain David Dykhoff in a ceremony held at Naval Station Norfolk. On 7 April 2008 George Washington, with CVW-17 and Carrier Strike Group 8 embarked, departed Norfolk, VA for the transit around South America where performed Gringo-Gaucho with the Argentine Naval Aviation, en route to Yokosuka, Japan to replace USS Kitty Hawk. After the planned turnover with Kitty Hawk at NS Pearl Harbor, Hawaii, CVW-17 and Carrier Strike Group 8 were to return to their home ports in the US to be replaced by Carrier Air Wing 5, based at Naval Air Facility Atsugi, and Carrier Strike Group 5 based at Yokosuka Naval Base in Yokosuka, Japan.